If you are a follower reader of this blog, you are probably aware that some weeks ago I called for submissions for a Group Writing Project dedicated to Minimalism in Photography. With it, I intended not only to discover what my readers had to say on the subject but also to further explore a “side” of photography that is very attractive to me. Although the complexity of the project was high, and thus the small number of submissions, I feel that Minimalism in Photography is actually something that many try to achieve probably without even realizing it. Going the minimalist way can produce extremely powerful images, but usually requires a special attention and some planning. Nonetheless, if one thinks minimalism, avenues of images start to open in front of the lens, and even cluttered scenes often have nice subjects for minimalist photos. I’m also including the images on this post. If the authors prefer that they be removed, just say so and I will. Kriz Cpec (did I got the name right?) 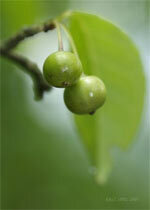 sends a macro shot of what seems to be some small fruits. It’s a very attractive photo with green as the major tone. 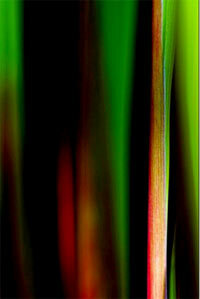 The shallow depth of field blurs the leaf and branches that blend nicely with the green background. Although it deviates from my own definition of minimalist, the single tonal palette and the focus on one particular subject can probably be sufficient to include it in the category. Rachel from The Feminist Phoenix also went for flora, but using isolation on black (done with lighting) to highlight only a few features of the flowers. 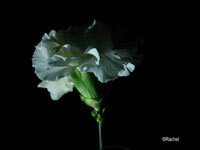 I particularly liked the way that the center of the flowers, that usually attracts flower photographers, is in shadows. I’ll have to say that the lighting used for the second photo was absolutely brilliant. Also, the cropping of the frame on the second photo was fantastic, giving it a sense of incompleteness that begs the brain to draw something there. She also shares her insights on these photos. Brian from the Epic Edits Blog brings us a fantastic article (as usual) in which he describes his approach and experiments to this project, from the preparation to the final processing of the photos. The line that comes out: “simple, minimum, shapes, lines, colors, empty space, look up, look down, walk slowâ€¦”. Since he has a collection of his photos there taken with this project in mind, the best is really to go and see them all. It’s worth it. Nonetheless, I’ll drop my favorite here. 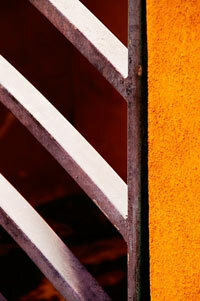 Notice how a repetition of lines mixed with highly contrasting colors can produce a visual shock (in the good sense). Chris (almost forgot you, sorry), goes for the color abstract. If I had to guess, I’d say we are looking at a macro of some grass leaves, but whatever it is, it creates a fantastic effect which is achieved mainly by the complementary colors filling the frame (red and green). I’d actually like to know how the processing of this one was done. Care to comment Chris? And finally, my own entry to the project. I will not choose any particular photo from it since it is basically a descriptive article with my thoughts on how a good minimalist photo can be achieved. I guess you’ll have to go and read it. And that is all for this project. To the people who have participated, I can only express my profound appreciation for your superb entries. I think that from just this few examples we can see how wide this field of photography can be and how worth it is to explore it further. I have the feeling that this will not be the last time you’ll read about Minimalism in Photography (and not only on this blog). Next Story → GeoTagging – Is it worth it? 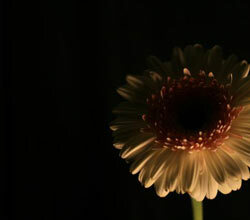 I like the second the best, the contrast of the darkness and the select features of the flowers, made all the more dramatic and creative. Thanks for such a positive description, it’s a big big boost. Just checked out your entries, they are all marvellous examples of what minimalist photos would be like. I will try to take photos following your tips there. Thanks for the mention; having arthritis in my hands I tend to processing to a minimum! Nothing fancy in the way of programs either, this was carried out in a freebie called Photofiltre, after converting the RAW file to JPEG in Capture One LE (free as well!). From what I remember, adjustments were made to the contrast and levels and then I used a couple of inverted colour layers and added a touch of sharpening? I still haven’t decided on which one is my favorite (maybe I never will). But I agree with you. The second group is very “dramatic”. I think that on the first one of the flowers, something could have been improved, even in processing, to highlight more the white, but nonetheless, is not bad at all. You don’t have to thank me. The photo is good, so credit where credit is due. Thanks for the explanations on your processing. I was actually expecting that more processing was put into it. Anyway, congratulations again for a fantastic photo. My flowers? Wow! The kind comments are greatly appreciated. I’m a very new photographer so encouragement helps. Also, I’m interested in what AM’s thoughts are on “Carnation in Hiding.” That is one of my own favorites, but the idea that making the white pop more is interesting.